Nguyen Minh Thanh broke onto the Hanoi art scene in the mid-1990’s with early success in painting, installation and performance art. His three installations, “One Road”, “Rice Field” and “I don’t trust anyone” were exhibited in England and at the South Korean Gwangju Biennale in 1999 while his paintings have been featured at a variety of international exhibitions including at Fukuoka Asian Art Museum and at the Asian Pacific Triennial in Brisbane Australia. 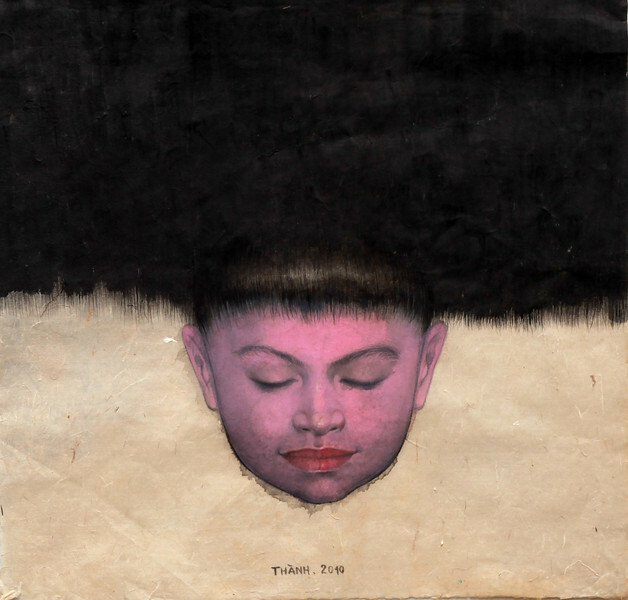 In the Hanoi Dreams exhibition we see three recent examples of Thanh’s signature work – the portrait. Using Chinese ink and watercolour on traditional Vietnamese Dzo paper, Thanh utilizes his own image in an exploration of his evolving self-concept. These poetic and philosophical images simultaneously convey the simplicity and complexity of human identity. The sparse colour palette and composition combine to convey a sense of peace and calm along with the inherent inner beauty of the individual.